Welcome to the Soul Survivor locations thread! Michael wakes up after been drugged and dumped (just the other side of the road where he stopped to assist Adrianne as it happens). Now, I’ve been looking for the following location on-off for a little while now, and finally stumbled upon it. Initially I was certain that these scenes were going to be located in the general Santa Clarita/Valencia area but an hour or so of scouting soon discounted that theory. This seems to have been much used location over the years, including ‘The Topaz Connection’, Soul Survivor’ and ‘The Nineteenth Hole’, presumably due to it’s imminent residential development (AKA terraforming) and therefore no worries about damaging the immediate environment with jumps and explosions and whatnot. It is also the location of some of the most iconic Knight Rider scenes ever filmed. Approx location of the iconic Turbo Boost over Michael and KITT TV in Devon’s Mercedes - though it may have been located a couple of hundred metres to the south on what is not a park field just next Lang Ranch Parkway, and the same area as the Turbo Boost scene from ’Topaz’. The camera lens perspective/distortion makes it difficult to ascertain the exact spot of the jump, but this is the approximate location all the same. Now a gated community - and the same location as the off-road race track in ’The Nineteenth Hole’. 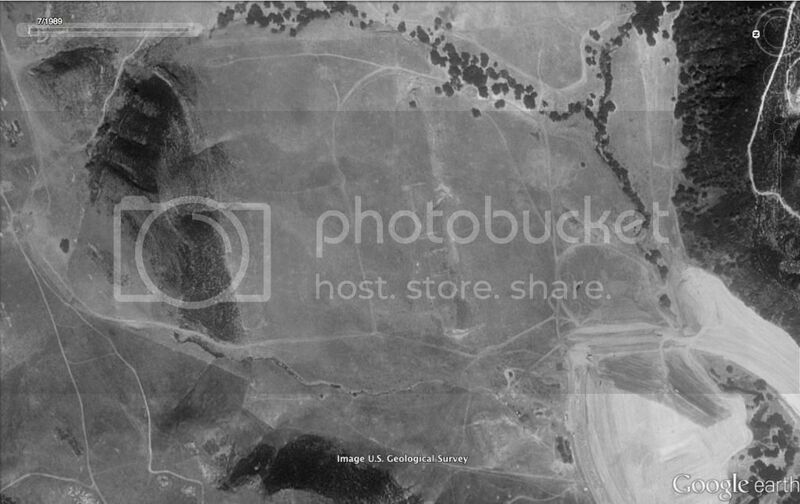 Michaels rendezvous with Adrianne, the farm and barn buildings are still visible on the 1980 imagery of the location on Historic Aerials. Dirt Tracks - Where Randy remotely controls the Knight 2000 and toys with Michael and KITT TV.